Welcome to the Razor MX350 Review by Kids Ride Wild. 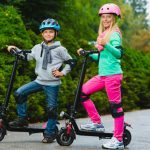 Perfect for adventure-seeking kids that have grown tired of their bicycles, the Razor MX350 provides the perfect stepping stone for pre-teens and early teens to transition towards motorized vehicles. We know, it’s hard to think that in just a few short years they’ll be driving, but making the transition in the safest way possible is one of the reasons Razor created the MX350 Dirt Rocket, one of the most popular pit bikes for kids. 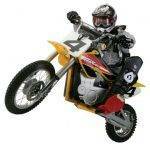 This scaled down dirt bike is perfect for your little dirt devil. Made specifically for smaller frames under 140 pounds, this off-roader is built for the dirt. Whether you have a boy or a girl, the authentic motocross styling of the Razor MX350 makes for a perfect look and fit. Your little one can zoom around for around 10 miles of travel time (more if they’re lighter) with one charge which keeps them close enough for you to keep an eye on. 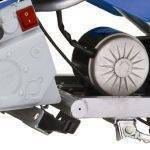 The super-quiet variable speed chain driven motor provides a surprising wallop of power so your child won’t be disappointed. The battery takes about 5 hours to charge and since it’s rechargable, you’re saving a ton of money versus a gas-powered motorbike. Depending on their weight, they’ll be able to reach top speeds of around 12 to 14 MPH, which is little faster than a golf cart for comparison. This is enough speed to get them over some pretty bumpy terrain and backwood trails, but not enough for them to take on jumps and other dangerous endeavors. 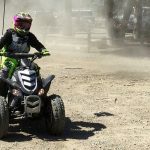 Your child controls the speed they’re traveling with a twist grip throttle control and brakes with a hand-operated rear brake—just like the big boy motocross cycles. For added smoothness, the riser handlebars give your kid some the perfect amount of cushion and control when going off-road. 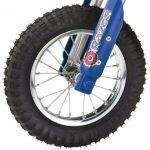 Plus, the large knobby tires provide some bounce and flex to the ride so your kids aren’t jarred around. Pads and helmet sold separately. 90-day warranty. While the actual age range for the Razor dirt bike MX350 is 12 and up, not all children develop and grow at the same rate. 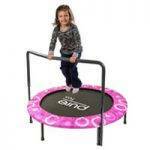 Ask any parent who purchased one and they’ll tell you that it’s actually ideal for much younger ages, like 5 to 8. The real number to keep in mind here is the weight limit which is 140 pounds. 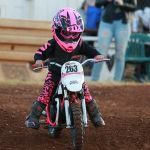 As long as your child is under that weight and you feel they are old enough to safely handle a scaled-down dirt bike, this is a great place for them to start. In fact, the younger your child learns motocross and dirt bike safety, the safer they will be in the future should they continue to ride. 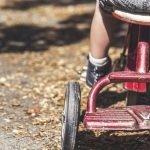 Either way, learning responsibility behind a motorized vehicle is a good idea—it’s the lack of exposure that makes things dangerous in the future. In other words, you are the parent, the exact age range is up to you but bear in mind that the mx350 dirt bike is an entry-level model for the youngest kids. In our opinion the mx350 dirt bike will be perfect for kids aged 5 to 8 and ideally under 75 lbs. If your child is on the cusp of weight limits on dirt bikes, you might want to take the same approach you do with their clothes and shoes: buy a size bigger since they are still growing. While a new shirt only costs a few bucks, a dirt bike is a pretty substantial purchase so you want to get as much life out of it as possible (although you could always resell it, but that can be a hassle). If you need a dirt bike that is one weight class up from the Razor MX350, check out this model. Even though the Razor MX 350 is electric (and not gas-powered), they travel pretty fast at 14 MPH. At that speed, a scaled-down motocross bike has to have some added safety features and the Razor MX350 certainly does. 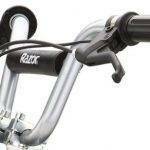 The frame is modeled after a professional motocross bike meaning it is super rugged, sturdy and durable. Undoubtedly, your kids are going to drop the bike a few times and you want something that is not only going to hold up, but keep them safe. Since the bike weighs only about 70 pounds, this is a great weight for smaller frames. It’s not too hard to handle and is easily liftable unlike a bigger dirt bike that is gas powered. As for the safety during the ride, your child will have full control of the throttle and brake with their hands (just like on a real dirt bike) and the adjustable riser handlebars provide the perfect, smooth ride. For added flex when going over rough terrain, the large, knobby pneumatic tires provide the perfect bounce to keep little heads from rattling around in their helmets! The UL approved charger takes about 5 hours to charge up and gives between 40 to 60 minutes of continuous use. The battery holds the charge for 12 hours so you can control how often your kids use their Razor MX350 (they can’t charge and go—it has to charge overnight). The high-torque motor has 350 Watts of power and runs on a 24V (two 12V) sealed lead acid battery the 12″ pneumatic knobby tires provide maximum power transfer. The Razor MX350 is the perfect choice for responsible parents who still want their kids to get out there away from video games and TV and have some fun—safely. The safety features that are built into the dirt bike are expanded upon by the fact the battery charge won’t hold forever and it must be charged for five hours—when your kids ride is up to you. Add this to the 10 mile cruise limit on the Razor MX 350 dirt bike and it’s easy to see why so many parents choose this model as their child’s first off-road dirt bike. If you want to see more photos of Razor MX350 and read first-hand customer reviews on Amazon, you can do so by going here. You may also want to read our Razor Bike Buying Guide to learn more about pros and cons of the other Razor dirt bike models.